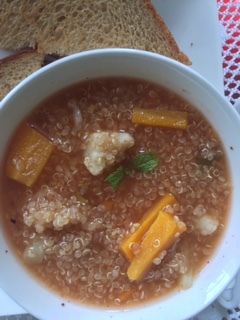 We are looking at dishes from the Southern Hemishphere this week, and in the last of the series, we have this amazing stew / thick soup from Ecuador that's chock-o-block with quinoa and hearty winter veggies like carrots, turnips etc. We had this sometime last fortnight for supper and it was one hearty bowl of food. Hope you enjoyed the series of these dishes with Choclo Al Comino (Peruvian style Corn) and Gram Bouilli (a Mauritian black gram snack). Although I prefer using local produce, quinoa is one grain(?) that I love to use often as its so versatile and lends itself in place of rice beautifully. I had to use a bag of quinoa that was lying in the kitchen and this soup for this theme fit like a glove. Today, we have Ecuadorian Quinoa Stew with veggies, adapted from here. Winter veggies - cut into chunks (I used orange carrots, Turnips, cauliflower and sweet potatoes) ~ approx 1 cup - I microwaved them for 5 mins with a pinch of salt. Wash quinoa in 3 changes of water. Soak for 5 mins. Drain. In a soup pot, add the oil. Sauté Onions and garlic till onions turn slightly brownish. Add the soaked and drained quinoa, veggies and rest of the stuff except paprika. Let it simmer away for 10 mins till veggies are cooked but not mushy. Sending this to BM#96 under "Cook from Countries in Southern Hemisphere" theme. Quinoa is the perfect grain for stews. Goes well with any vegetable combination. That’s a wholesome bowl of soup , turnips have a unique flavour , never used them in a soup , but sounds great . That is a hearty and wholesome winter soup. A wholesome meal and a Perfect bowl for the weather here! That is such a delicious and nutritious quinoa stew from Ecuador. Love the addition of veggies - makes it hearty and filling. Perfect for chilly winter days. That wholesome stew is calling me. For the temperatures we are having right now, this is a must have. A perfect stew for the chilly winters here and it is healthy too!! That is one filling stew, perfect for chilly weather. Such a filing healthy soup for a chiily evening. With all the veggies and quinoa this one must taste amazing. A very filling and a hearty stew with additions of veggies in it.